Sandhill cranes (Grus canadensis) mate for life. They prefer nesting sites in isolated wetlands, preferably with standing vegetation. One to three pale yellow to olive eggs with irregular brownish markings are laid in the nest formed from dried vegetation and lined with stems and fine grasses. After 29 to 32 days the chicks, who are capable of leaving the nest and swimming within eight hours, hatch. 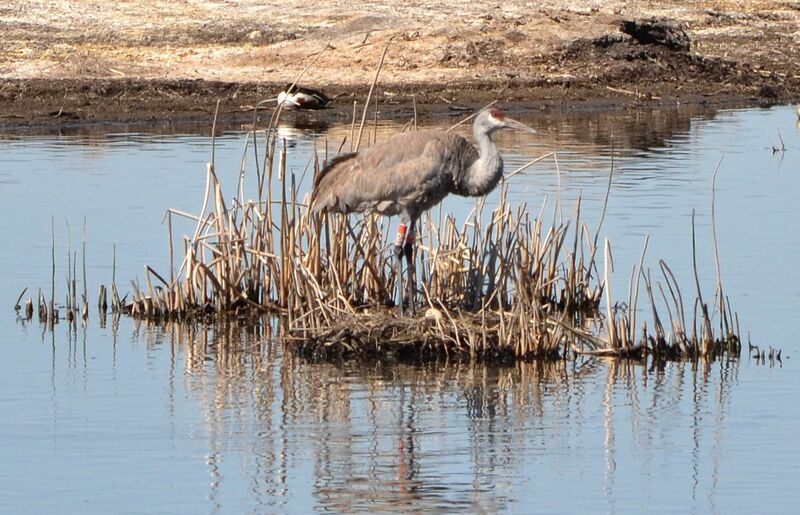 This sandhill crane is incubating her egg at Modoc National Wildlife Refuge near Alturas Ca. This entry was posted in Birds and tagged Grus canadensis, nature photography, sandhill crane. Bookmark the permalink. That is amazing to me and a treat to see !! !